Weekends in the garage are something to look forward to and the passionate enthusiasts from Griot's help your vehicle shine with their premium quality car care products. 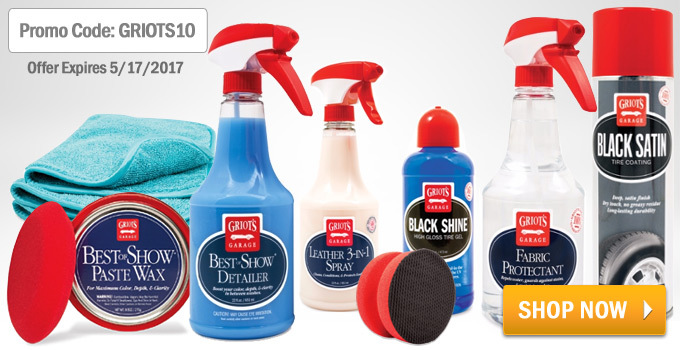 Let us help you get a head start with your weekend detailing with our revamped Car Care Section that makes it easy to find exactly what you you need, and now you can take 10% Off NEW Griot's Car Care Products like their Best of Show Detailer, Fabric Protectant, Surface Prep Mitts and more! Take advantage of this great discount offer from now until May 17th when you enter promo code GRIOTS10 at checkout. Quick Reply: 10% OFF Select Griot's Car Care Products at Pelican Parts!